This is another chapter that runs for 18min. Another entertaining chapter... though there wasn't much action to it. This one was more informative of the story then action packed. And for the first time... this chapter had some fairly bad video. the picture even blacked out for a second a couple of times. Once again... the cliffhanger wasn't all that great either. I hope this doesn't become the norm. This is a movie I have not seen since I was about 14 years old. More then 25 years ago! I remember enjoying it at the time. So when I found this release fairly cheap I jumped at it. Going into this movie I was hoping it didn't age too badly. OMG those computer systems definitely ages the movie. But the story itself doesn't feel too aged. The story is still very much enjoyable. One thing I never liked about this movie is Dabney Coleman. For some reason he has always rubbed me the wrong way... I just never cared for him. I do like Ally Sheedy though... when I looked her up in my collection I was surprised this is only the second movie I have with her in my collection (this and Man's Best Friend)... and then I have her in 1 TV series episode (Dead Zone: Season 2: Episode 11). I noticed that one of the extras of this disc is a first look at WarGames: Dead Code. Has anyone here seen this movie? Is it worth adding to my collection? Going by the first look at it I am not sure if this is a sequel, a remake or what. But it looks like it at least could be good. This chapter runs for 20min. This chapter started off strong... then it slowed a bit in the middle. It picked back up right be3fore the cliffhanger... which was alright at best. This chapter looked good no complaints quality wise. You don't have "The Breakfast Club"? Never even seen The Breakfast Club. Moving into a new house can be frightening. Moving into this one is deadly. Edward Albert (Mimic 2), Susan George (Straw Dogs) and Doug McClure (Maverick) star in this horrifying haunted-house tale about a young American family moving into an old Japanese house where the dead don't rest...and history is about to repeat itself. A century ago, a samurai brutally murdered his adulterous wife and her lover before taking his own life. Now, the Fletcher family has found what they think is their perfect Japanese home – not knowing it's the same house where the murders occurred. But as strange events escalate and the ghosts of the dead toy with the living, the Fletchers discover they've become unwitting players in a horrible reenactment...one which they may not survive! I normally like the '80s horror... but this movie just didn't impress me to much. I just found it to be to slow. And the effects of the ghosts leaves a lot to be desired. I bought this DVD 2 years ago around Halloween... and just now getting to it. At least I got it cheap during the Halloween sale. I only paid $3.33 for it. This chapter runs for about 18 min. I was kinda disappointed in the way they handled the last cliffhanger. But at least it was somewhat realistic. The chapter was pretty good... I enjoyed it. I especially liked the cliffhanger at the end of this one. They need more cliffhangers like this one in this serial! You haven't even seen The Breakfast Club? How did that happen? just never had the opportunity I guess. well I can understand that...there are some that I haven't seen yet too. You’ll go “beserker” for this pulse-pounding action thriller that sinks razor-sharp adamantium claws into the mysterious origins of Logan/Wolverine (Hugh Jackman). Discover his epically violent and romantic past, his complex relationship with Victor Creed/Sabertooth (Liev Schreiber), his encounters with new, legendary X-Men and the ominous Weapon X program that unleashes his primal fury! This is the first time I watched this movie since I seen it in the theater. And Brittany watched it with me again. This is her 3rd time seeing it. I guess like Achim said... she must see Hugh Jackman! I enjoyed watching this one very much! It has a lot of the mutants and a lot of action. This movie is just so much fun to watch. After watching this I now feel like watching the 3 previous X-Men movies. But I won't since I need to finish this marathon. 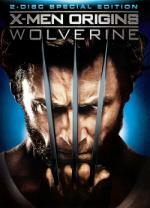 I really enjoyed every minute of it... but then I have always liked the character of Wolverine. Did you find where the 2 scenes that played after the credits are on the DVD? My copy has both of them. I think they were with deleted scenes. Watched them in the credits... or are you talking about different ones? just looked at the deleted scenes... didn't see anything for the end of the movie there. That's the ones I meant...the ones at the end of the credits. Did they have both at the end of them on the DVD? Hmm..now I can't remember if I saw them that way on the DVD or with the deleted scenes. Ok..just saw your other post. Then I must have seen them at the end of the credits. I just knew they were on the DVD somewhere.